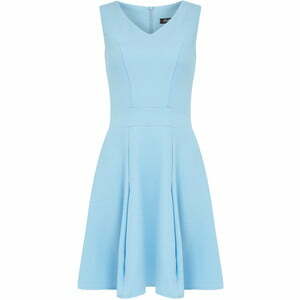 What is the color baby blue and what matching colors you can wear with it? This is very light shade, which is associated with children’s crib, but it looks very stylish in today fashion outfits. This color perfectly accentuates skin tenderness young girls will look refreshing and youthful on women more solid years. In addition, clothing colors Baby blue non-aggressive, it makes to the image of women is not only a romantic touch, but simply peace and harmony. Baby blue matches well with floral and plant colors, as well as with the whole range of pastel shades. This color combos will be perfect, but also you can combine it with classic black or complementary midnight blue. Baby blue color is welcomed not only in clothing but also in accessories, shoes and nail polish.